We'd already be in raptures: all of the usual prerequisites for happiness - minimal amount of money, plenty of homemade food and non malicious laughs at the ready, but then this: 'You need coolin', baby I'm not foolin' - the volume rising steadily, trying in vain to match its listeners combined levitation - to wherever it was they were off to. No words. Just a collection of pensive, 'much appreciated' smiles. The odd nod. One of the matching panel-vans parks out front and delivers its board-shorted driver who's only too happy to stumble into 'mass', in perfect timing. 'Hey, hey mama said the way you move'.. is our music man aware of the gift he's giving? 'Someone told me there's a girl out there with love in her eyes and flowers in her hair'.. are we as loud as we can go - have we proven to her just how much we adore her. Our gesture of thanks still not feeling like it's enough. And yet, still she gives. We used to hide them, or mix them up, or whatever it was on the day. Three little virtuous monkeys, their little hands covering certain senses - their assorted vacations causing my best friend's mum to (laughingly) get cranky. So significant were these little monkeys, not only because of the silliness we would get up to with them but, along with my best friend's step-father's LED ZEPPELIN collection - were / continue to be (as much as humanly possible) a household staple. Love (and good times) - the best religion of all? 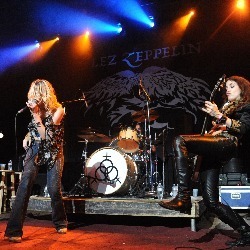 Thank you, Led Zeppelin, for years and years - and years of warmth (and good times). Let's ramble on, in this whole lotta love.